With nothing better to use, scratching a couch or a chair is natural for a cat - even a cat who has no claws. Why do cats scratch? To groom their claws, of course. But they also scratch to stretch the muscles in their backs and to mark their territory, both visually and with their scent. How do you keep your cat from using your furniture to do what comes naturally? Just offer an alternative. ---Provide a variety of surfaces for your cat to scratch. Some suggestions: scratching posts covered with sisal, burlap or carpeting; corrugated cardboard scratchers; carpet remnants; wood or logs; and door mats. ---Choose scratching posts that are stable and tall enough for your cat to have a good stretch. The cat should be able to stretch up to full length and arch her back. Entice her to the post by sprinkling catnip on the base and hanging a toy at the top. ---Invest in cat furniture, or build it yourself. with sisal makes a great cat tree. Cat furniture provides opportunities for scratching, climbing and napping all in one place! ---Keep your cat's nails trimmed. Ask your vet to show you how. Declawing is a painful operation, and it can cause more problems than it solves. Declawed cats are more likely to develop litter box problems. Many become biters. And because they're unable to really stretch the muscles in their backs, they're more prone to arthritis. Before you declaw your cat, please look at Dr. Christianne Schelling's declawing Web site, declawing.com, and this article by a vet tech. — Put a scratching post at the entrance to a room or against the furniture she's scratching. Lure her to the post by sprinkling catnip on the base and by playing with her near the post. — Cover the furniture she's scratching with vinyl carpet runner bumpy side up; shelf paper, sticky side up; double-stick tape, bubble wrap or sheets. Cats find scratching smooth fabrics like sheets is not very satisfying. — Rub the furniture with a scent cats dislike, like citrus. — Use an electronic deterrent, like a ScatMat. The cat won’t like the tingling sensation underfoot. --- Try Soft Paws, soft plastic caps that are glued onto the cat's claws. Scratcher from Molly and Friends. 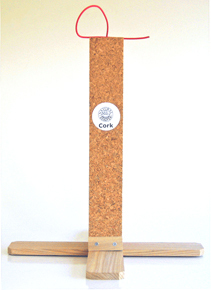 Natural Scratch cork post. It's 32" high. 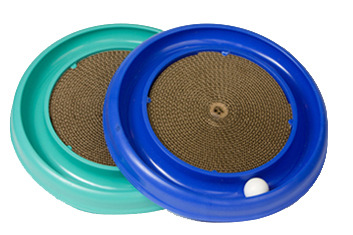 Cats love the Turbo Scratcher, available from most pet supply stores. To contact us, click on our mail cat. Please visit our online store. Beautiful handmade jewelry and cat-themed T-shirts are waiting for you there, and all the proceeds go to our cats!